This unprecedented reference work systematically represents the history and culture of Eastern European Jews from their first settlement in the region to the present day. More than 1,800 alphabetical entries encompass a vast range of topics, including religion, folklore, politics, art, music, theater, language and literature, places, organizations, intellectual movements, and important figures. The two-volume set also features more than 1,000 illustrations and 55 maps. With original and up-to-date contributions from an international team of 450 distinguished scholars, the Encyclopedia covers the region between Germany and the Ural Mountains, from which more than 2.5 million Jews emigrated to the United States between 1870 and 1920. Even today the majority of Jewish immigrants to North America arrive from Eastern Europe. 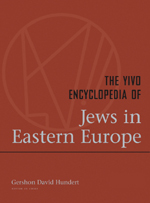 Engaging, wide-ranging, and authoritative, this work is a rich and essential reference for readers with interests in Jewish studies and Eastern European history and culture.